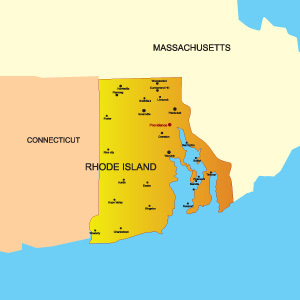 Rhode Island is second most densely populated state in the United States and is nicknamed The Ocean State. It is home to over 1 million people and is one of the original 13 colonies. The capital and largest city is providence which is home to over 180,000 people. The bordering states are Massachusetts and Connecticut. The major highways servicing the state are I-95, I-295, I-185, and I-84. Other modes of transportation such as air travel can be used at airports like T. F. Green Airport and Logan International Airport. Notable universities in Rhode Island are Brown University and University of Rhode Island. Attractions that bring in tourism are baseball games at McCoy Stadium in Pawtucket and Dunkin Donuts Center.